Nations Press feature news UNBELIEVABLE: This Transgender Got Pregnant, The Reason Will Surprise You!!! UNBELIEVABLE: This Transgender Got Pregnant, The Reason Will Surprise You!!! SPONSORED LINKS I never thought about getting pregnant. Because of the male hormones, I didn’t think it was a possibility. It was definitely a surprise,’ he told. 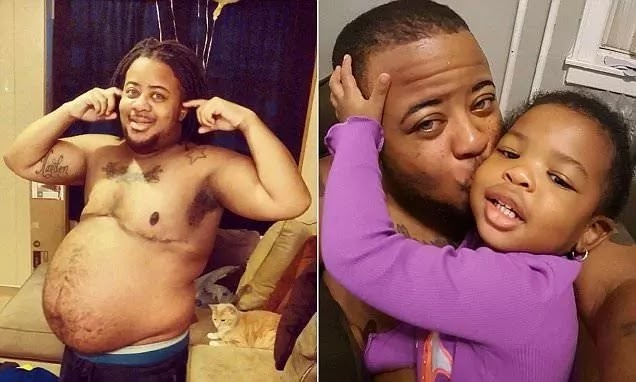 Kayden Coleman, now 29, was stunned with a bloated tummy and back pain in 2013. At first, he even joked he should get a pregnancy test when he was hit with the pain. The joke wasn’t too funny as doctors confirmed a baby was on the way. ‘It felt like there was a pillow under my stomach but there was no pillow,’ he added. The unexpected bundle of joy was made possible as Coleman had to take a six-week break from using hormones, in preparation for a double mastectomy. “I was shocked. It took a while to process it. But I was also busy figuring out how we could make things work in such a short space of time,” he said. To ease the burden, Coleman had to quit his job and Elijah worked longer hours to care for baby Azaelia. Now almost two years later, the family said they finally have their happy ending. “Now it feels great. I couldn’t imagine, and don’t want to imagine, life without her. She is amazing,” Coleman told.